Exoplanets near the galactic center could accumulate sufficient dark matter to keep them warm enough to sustain life. Dark matter is perhaps not the first thing that comes to mind when considering how life can be supported on another planet, but to Dan Hooper and Jason Steffen of the Fermilab Center for Particle Astrophysics, dark matter could be a contributing factor in allowing life to evolve and survive on distant worlds outside of our solar system. The scientists propose that dark matter particles could sink into a planet’s core, and through the annihilation of matter, release enough energy to keep the surface of the planet warm enough for liquid water, even outside the traditional habitable zone. Dark matter was first postulated in 1933 by Fritz Zwicky, and then again in the 1970s by Vera Rubin to account for evidence of ‘missing mass’ in the orbital velocities of galaxies in clusters and stars at the edges of galaxies. Dark matter is inferred to exist from its gravitational effects on visible matter and background radiation, but it emits no visible light and does not interact with any other matter except by gravity. Despite elusive evidence for its existence, it has been hypothesized to make up around 23 percent of the composition of the universe (the rest being 4 percent “normal” matter and 73 percent dark energy, which is the unknown force driving the accelerating expansion of the Universe). Dark matter is said to influence the evolution of the universe gravitationally, even though scientists are still in the dark as to what it is. In dark matter-rich regions of space, enough dark matter can accumulate inside ‘super-Earths’ -- rocky planets with masses several times that of our home planet -- to provide enough energy to keep the surface of the distant world warm enough for liquid water to exist. 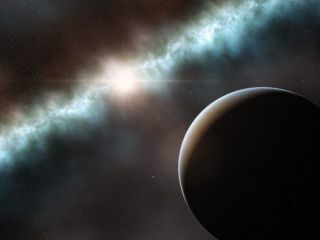 This holds even far outside the star’s habitable zone, which is usually described as the distance from the star where temperatures, among other factors, allow water to remain as a liquid on the planet’s surface -- an essential condition for life as we know it. In principle, dark matter-rich planets could widen the habitable zone and increase the number of locations where we could find life. Nevertheless, with billions of planets predicted to exist in our galaxy, it appears possible that some planets could benefit from dark matter, and these worlds would be very different to Earth. The heat provided by the annihilations of dark matter, state Hooper and Steffen in their paper, could keep a planet habitable for trillions of years, even beyond the lifetime of its star.